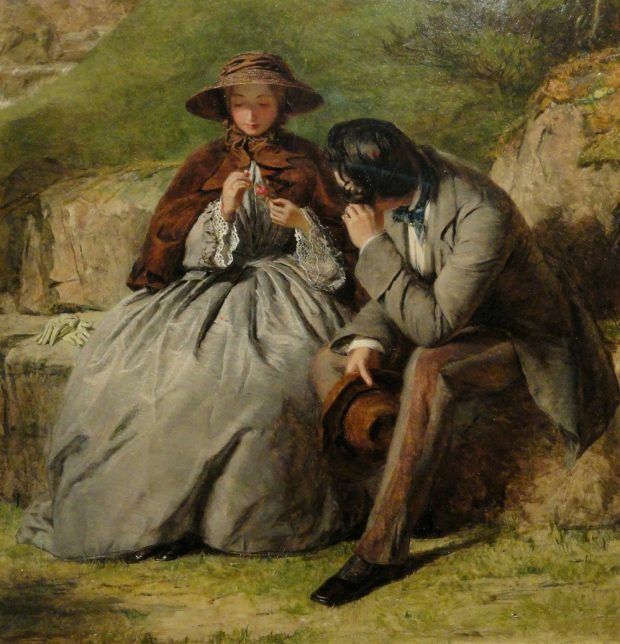 The Lovers by William Powell Frith, 1855. For many single ladies and gentlemen of the 19th century, placing a matrimonial advertisement in a local newspaper was considered a viable alternative to traditional courtship. It was especially popular with those who were new to an area or those who had no family or social groups through which they might otherwise obtain an introduction to a suitable partner. Naturally, there were those traditionalists who frowned upon this method of acquiring a spouse. It was viewed as undignified, indelicate, and dangerous. Even so, matrimonial advertisements were utilized by men and women of every age and every class throughout the Regency and Victorian eras. The following matrimonial advertisement was placed in an 1811 issue of London’s Morning Post, where I found it humbly sandwiched between a solicitation for a loan of £50 and an advert for a “Capital Pianoforte.” Notice that the lady advertising does not mention her appearance, her age, or whether or not she is a widow or a spinster. Morning Post, November 27, 1811. The next matrimonial advertisement is from an 1822 edition of the Morning Post. This advert is far more specific than the previous, with the gentlemen stating clearly what he wishes for in a wife in terms of age, income, and character. Morning Post, December 19, 1822. At the higher end of the social spectrum, an 1823 issue of the Morning Post contains a matrimonial advertisement in which a “nobleman” seeks a “Lady of Fortune.” I do not know who this nobleman was, but it is hard not to imagine him as one of the countless romance novel heroes with an impoverished title who must marry an heiress in order to repair his estates. Morning Post, June 25, 1823. 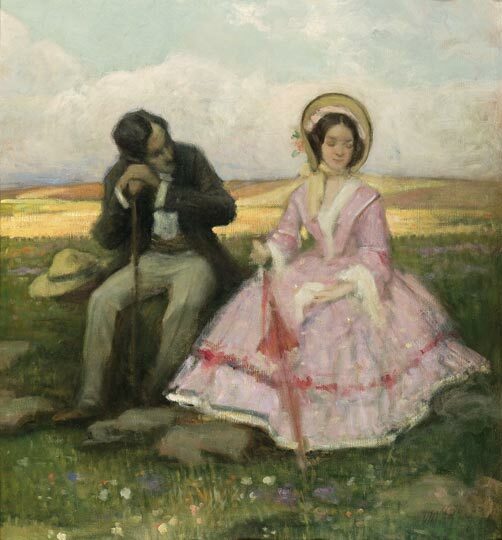 Courting by Géza Udvary, 19th century. This advertisement received more than forty letters in response, one of which was from a woman named Mary Moore. She and William Corder were married a week later. A short time after, Mary discovered that, before placing his matrimonial advertisement, her new husband had brutally murdered his last lover and buried her body in a barn. Corder was tried, convicted, and ultimately executed for his crimes. In subsequent years, this sensational case, known as the Red Barn Murder, was used by many as an example of the terrible fiends one might find at the other end of a matrimonial advertisement. Catholic Telegraph, June 10, 1854. Religion was an important consideration in many matrimonial advertisements. In the following advertisement from an 1892 edition of the Kent and Sussex Courier, a “good looking bachelor” seeks a Christian widow or spinster. Kent and Sussex Courier, November 11, 1892. In a similar matrimonial advertisement from the 1894 edition of the Derbyshire Courier, an “affectionate” spinster seeks a “high principled Christian gentleman” with a “sympathetic nature.” I found this advertisement somewhat poignant – perhaps because the lady mentions her loneliness. Derbyshire Courier, November 13, 1894. Not only were matrimonial advertisements a way for isolated individuals to connect with potential mates, they were an economical alternative to the balls, parties, and expensive entertainments that one must usually attend when seeking a spouse. Of course, the traditional way of finding a husband or wife was in no danger of being supplanted anytime soon, but it’s nice to know that those in the 19th century who lacked family, friends, and great fortune, still had a means of making meaningful connections. 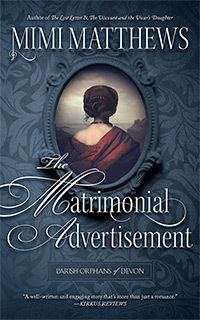 *Author’s Note: My next book The Matrimonial Advertisement will be out in September 2018. Set in 1859, it features a battle-scarred ex-army captain who places an advertisement for a wife. The mysterious lady who arrives on his doorstep isn’t quite what he was expecting. You can read an excerpt from the first chapter HERE. Foster, George. Foster’s Trial of William Corder for the Murder of Maria Marten. London: George Foster, 1828. “Matrimony.” Catholic Telegraph. June 10, 1854. “Matrimony.” Derbyshire Courier. November 13, 1894. “Matrimony.” Kent and Sussex Courier. November 11, 1892. “Matrimony.” Morning Post. December 19, 1822. “Matrimony.” Morning Post. June 25, 1823. “Matrimony.” Morning Post. November 27, 1811. Phegley, Jennifer. Courtship and Marriage in Victorian England. Santa Barbara: ABC-CLIO, 2012. M. Y. Some Remarks on Matrimonial Advertisements Being an Inquiry into their Use and Abuse. London: Sedding and Turtle, 1832. Fascinating, as ever Mimi. Interesting that so many adverts required replies to be post-paid, even when the advertiser is (according to the advert itself) a person of means. Sounds a bit penny-pinching to me, but maybe it was just how things were done. the song does, which I’d forgotten, mentions her ‘suckling at her mother’s breast’ whereas she was her stepmother, but very fond of Maria. Thanks, Sarah. I hadn’t even heard of the murder until I started researching this article and then I learned of it via the 1828 book by George Foster publications (which reprinted Corder’s original advert). The story reminds me a little of Theodore Dreiser’s novel An American Tragedy, which was later made into the Liz Taylor movie A Place in the Sun. Oh, good point. It hadn’t occurred to me that Corder could have made money off all those penny dreadful type publications on the murder. Inspired by you, I’ve gone past notes and written the first chapter! Love it! Thanks for posting such an intriguing article. Just may have to include something along these lines in one of my books! You’re very welcome, Pam :) So glad you liked it! One of my favorite romance novellas is “The Best Husband Money Can Buy”, a Christmas story by Mary Jo Putney. It’s based on a real-life incident that sounds made up until you read the news accounts. History is still the best resource for writing great romance, so thanks again. You’re very welcome, Darlene :) I’ve been mulling over an 1860s story that starts with an advert for a wife and, once I started researching, the results were too interesting to keep to myself. You are so right about history being the best resource for authors! I love it :) And you’re right – it does read like a job description. In fact, it sounds as if what he really needed was a housekeeper! The great advantage of a wife over a housekeeper was that the wife didn’t have to be paid and couldn’t hand in her notice, either, if she found she didn’t like her new life, a few months into the job! Women went along with it, though, which shows the power of culture. Very true, Joanna. It’s amazing what women went along with back then – and still do, to some extent! Societal/cultural pressure is a very powerful thing. So true, Joanna. In the 19th century, women were property, pure and simple, and as such could be treated like slaves. On top of that, I can only imagine how many women (especially when they reached the age where they were considered “spinsters” which, in some cases, was something ridiculous, like mid-late 20’s) their families pushed them to marry anybody who could support them and get them off her hands, regardless of what kind of person the man was. We can be thankful that things have changed drastically in the past 100+ years. Fascinating article by Mimi Matthews on lonely hearts of the 1800s. Thanks for the reblog, Laura :) I’m glad you enjoyed it! The Red Barn murder–fascinating! Nothing better than pouring through the post–letters and newspaper clippings–of the times. I agree, Angelyn :) I could read through 19th century newspapers all day. They’re a treasure trove! And I have a limit on myself or I’d spend all day reading and saying ‘oh listen to this, this is interesting…’ to the long suffering husband and would never get any work done. You have more willpower than I do! I like getting royalties… and you only get royalties if you keep the nose to the grindstone. Venality, m’dear, not willpower. I have no idea how to reblog, so I’ve posted a link and the first chapter of the next Brandon Scandal book. You’re very welcome, Alfred :) And yes, matrimonial adverts were definitely the 19th century equivalent of modern day internet matchmaking sites. For the most part, the 19th century matrimonial adverts seem to be straightforward and businesslike. Ironically, Corder’s advert was one of the longest and most personal!